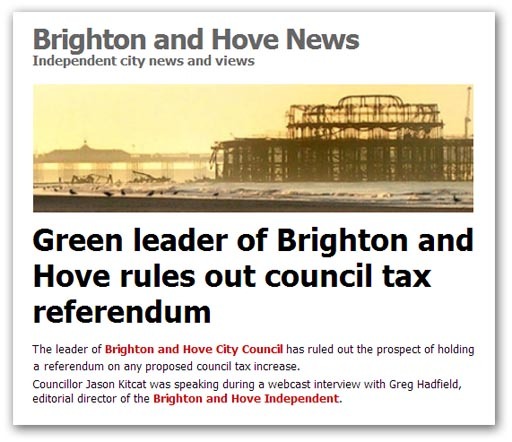 Demonstrating their anti-democratic credentials, Green Party councillors in Brighton and Hove have set their face against holding a referendum in order to seek an increase in Council Tax over and above the two percent permitted without holding a poll. But what is especially telling are the comments of the Green Party leader, Councillor Jason Kitcat, who called on the government to allow councils like Brighton and Hove "more freedom to raise money from taxes". Councils actually have freedom to increase Council Tax but, before they do so above the two percent level, they are required to hold local referendums, the results of which are binding. Thus, if the people reject an increase, councils are not allowed to up their charges. What Kitcat is doing, therefore, is not only denying his electors the chance of deciding their level of Council Tax, he is seeking power to raise taxes without having to gain the approval of his voters. This proto-dictator wants "freedom" to increase taxes but would deny voters the right to refuse increases. Such remarks illustrate with some clarity the real nature of these people, reinforced further by Kitcat, when he says: "The referendum rule is mad. It's not really workable and would cost about £300,000 to run". Here, you can see another tactic at work, talking up the cost of something that the council does not want to do. Yet, when trial referendums were carried out, the highest estimate was £150,000 and one council estimated that the cost could be brought down to about £70,000 if combined with normal council elections. With the development of electronic voting, costs could be brought down still further. The relatively modest costs of true democracy compare with councils spending millions on freesheets – so-called "Town Hall Pravda". They have been spending tens of millions, out of a communication budget of £400 million a year, with one council alone spending over £5000,000 on its newspaper. Thus, there is no expense spared when councils want to spread their own propaganda, but when genuine consultation is called for, we get a council (and a Green one at that) complaining about the cost. This comes on the back of sustained resistance from the Local Government Association (LGA) to the very idea of Council Tax referendums. In May of this year, we saw an example of this, the disdain which local authorities show for the idea of democracy, as they sought to prevent Communities Secretary Eric Pickles tightening the "referendum lock" on council tax. As the Local Audit and Accountability Bill enters the final reading in the House of Lords, the LGA is intensifying its resistance (paywall), urging the government to publish its estimates of the impact of new council tax referendum rules on long-term infrastructure projects, amid fears of a "significant threat" to city deals and flood defences. This is another classic ploy – shroud-waving in the face of tighter controls over spending – but once against disguising the essential anti-democratic nature of local government. The LGA argues that the requirement to submit increases in Council Tax (to include increases in levies and precepts) "could threaten councils' long-term financial sustainability and leave authorities unable to invest in major infrastructure schemes such as transport systems, putting jobs and investment at risk". But a Department of Communities spokesman said: "There is no reason that the Bill will affect infrastructure projects. If local authorities want to raise Council Tax because of levying bodies then they should be prepared to argue their case to local people in a referendum". Referring to "City deals", which are being used to fund capital schemes, the spokesman said that they, "are important in encouraging investment and improving infrastructure, but they are not vehicles for bypassing the right of local people to vote on excessive council tax increases". The right of people to vote – where it actually means something – is, of course, the last thing these anti-democrats want. But their arrogance is the only transparent thing about them. "That democratic consent thing is unworkable. Can't have the plebs having a say on whether the council should be allowed to keep spending like Paris Hilton on a coke binge", says North Jnr. And this is why the right to limit council taxes is a central part of The Harrogate Agenda. In their resistance to even modest requirements for increased democracy, Councils are showing their true colours. We now have a battle on our hands. Taxes, as currently constituted, have no legitimacy and the likes of Councillor Jason Kitcat are going to have to learn that the principle of "no taxation without consent" is going to be the way of the future. We are coming, and there is no stopping the power of an idea. UPDATE: Predictably, this issue is getting next to no coverage from the media, as Autonomous Mind notes. He identifies an LGA briefing note, reiterating its opposition to council tax referendums, calling the requirement, "a significant threat to both local government's financial stability and infrastructure investment". Never mind that Council Tax is a significant threat to my financial stability, and to the financial stability and wellbeing of thousands of taxpayers. These "robber barons", as AM describes them, have not the slightest idea of what democratic accountability actually means. Their priorities are always put before our priorities – they decide how much we have to pay, and it then becomes our duty to pay these thieves, on pain of imprisonment.